Deva wrote: Runic Kryamane + Mag Intense: 59 Forging. Nearly two months later, I now have the mag intense rune, 25 kryanbor nuggets and a similar quantity of domane nuggets (I haven't discovered the kyramane ingot recipe so turn nuggets into ingots yet), is it OK to send it all over to you later? I also don't understand quite how the Galandor thread ended up where it did, though I witnessed similar when I played Everquest many years ago. Didn't understand it then either. Updated. Can anyone enter the Imperial Hall? Heard Betanesque Inn-like items (dyes and tabards), plus slightly more. Ran numbers for collecting Irandgard Root. x = 6.4. Remains possible with normal potions. 6.6 normal: Black Varec/Lamden Mariglacius/Glacin. 6.7 runic: Twistyfoot/Black Varec/Any Rune. 6.8 runic: Twistyfoot/Any Wild/Pho. - 5.0 Swamp jewelry (with Oceanite). Lumped Golem Monster and Hero together. x = 66.857. In other words, 67 for Hero and companion (or 68/66). Where can you level this high? Anderversan Woods B4. 63 Swamp. Stomachs the first three. Questions whether number four is a dealbreaker. Leans towards yes. Sounds extraordinarily not fun, even among grinds. Deva wrote: Updated. Can anyone enter the Imperial Hall? Heard Betanesque Inn-like items (dyes and tabards), plus slightly more. Using alt account which brought "Princania"
Location : Imperial domain, tab "Mansion Celestine"
Location : Imperial domain, tab "Terrace of the Bladed Robe"
action : Participate in the duels. 15 offense, 10 seconds. Alt can't do this as offense is 10.4 (26 * 0.4 - it calculates this as hero offense skill *0.4 so 38 offense needed), consequently I don't know what happens. Text suggests combat. My main account with emperator is in the middle of a 7h task so I will check what additional options it gets this evening. It's a shame I did just the minimum botany required to get my Eliandel wing on my main. Farming the swamp increases will be pretty bad. There's usually SOMETHING with intelligence in Anderversan so your boars are going to get wrecked while you try and raise hero swamp. I will check out the new area when I get home. That 1000+ gold for a dye is kinda crazy. I wonder if that's the same dye though that will be given for cheaper to the Emperator purchasers. Also I guess the value of those cyanblue/greengold dyes from the last special quest aren't as high if you can just buy em here. Ayrann + Pyr Latent: 50 Taming. Ayrann + Pyr Watchful: 52 Taming. Nocturial + Stra/Eli/Mag/Hydr/Lect/Pho/Ethe/Rad Latent: 59 Taming. Nocturial + Eli Watchful: 62 Taming. Palpable + Pho Watchful: 54 Herbalism. Oceanite + Psy Latent: 54 Herbalism. Oceanite + Psy Watchful: 56 Herbalism. Charges 300 gold per Latent Rune, 1000 gold per Watchful Rune, and 300 gold per Nocturial. (Requires two Nocturial per whip.) Deems Ayrann, Palpable, and Oceanite negligible. Offers while supplies last. Accepts materials too. Thought about market prices. Used conservative numbers. Time per Giant Pine action: 1.389 hours. Time for all Giant Pine Trunks: 260 * 19.446 hours = 5055.96 hours. Carried six trunks per trip. Lowballs it at fifteen minutes per. (260 / 6) * 0.25 hours = 10.833 hours. Time per Giant Beam: 4.167 hours. Time for all Giant Beams: 4.167 * 260 = 1083.42 hours. Ignored expansion cost and time. Totals 6211.293 hours. Likens it to Halmvik Spying. Earns 5.2 gold per hour. Converts to 32298.724 gold. - 10 Volcanite * 1750 gold = 17500 gold. - 25 Salandrin * 2 gold = 50 gold. - 25 Salancedar * (2 hours per plank * 7 gold per hour + 3 gold for one-third of a potion) = 25 * 17 gold = 425 gold. - 10 Xuran * 15 gold = 150 gold. - 10 Jutug * 20 gold = 200 gold. - 500 Nuertesilicio * 0.12 gold = 60 gold. - 200 Fortified Leather * 3 gold = 600 gold. Total cost: 21525 + 32298.724 = 53823.724 gold. Estimates a Stonecutting/Tanning Norstrian Temple at 53823.724 gold (conservatively). Produces two tools only (Taming and Herbalism). Appeals to a limited number of customers. Wishes to recoup its cost, at minimum. How much demand will there be? Cannot say. Chooses ten buyers. Includes interested guild members. (Receives a significant discount, however.) Totals twenty tools. 53823.724 / 20 = 2691.186 gold. Concern: Erected this collectively, not alone. What about other guild members? Benefits from the aforementioned price cut. (Eliminated location. Lowered rune, material, and skill prices.) "Competes" with guild crafters too. Shares buyers, however. Doubts more than ten per tool. Combined runic artifact identification with the Lupuntar Fortress daily task. Assumes identical fragment distributions. Guesses (without data) two fragments from Lupuntar Fortress daily. 2 * 0.201 = 0.402 Watchful Fragments per day. Opts to gather runic artifact fragments purely through companions. Spends 9.723 hours per companion attempt. Yields 1-3, 50% at a Starfield Dig Site. Averages to one fragment per attempt, conveniently. Gathers (24 / 9.723) * 1 = 2.468 fragments per day per companion. Assumes the maximum four. Totals 9.872 fragments per day. Becomes 9.872 * 0.181 = 1.787 Watchful Fragments. Add Lupuntar Fortress. Equals 2.189 Watchful Fragments daily from all sources. Total cost: (114.654 * 6) + (328.92 * 8) = 3319.284 gold for one Watchful Rune. Collects more than Watchful Fragments, however. Still + Latent: ((13.705 days * 9.872 unidentified) * .667) + (13.705 days * (1.598 Luptunar Fragments * 0.741)) = 106.471. Intense+: ((13.705 * 9.872) * 0.052) + (13.705 * (1.598 * 0.058)) = 8.306. Finds enough fragments for 3.549 Latent Runes, plus 8.306 fragments technically usable in a Watchful Rune. How good are Latent Runes? Varies by 0-4 on tools, generally around 2-3. Works in 7.2 runic Forging potions too. Splits the gold amount arbitrarily. (Excluded Intense+ fragments. May want them someday.) Selects 50-50. Falls to 1659.642 per Watchful Rune (and 467.637 per Latent Rune). Demands fairly high skill. Requires 40 Vinnerson (Whip) or 40 Soriason (Mortar and Pestle). Kept it low (50-100 gold). Desires a round number. Decides after totaling everything. Includes potion cost. Matters more in other trades. Considers Oceanite, Palpable, and Ayrann negligible here. Continues conservative pricing. Values Nocturial Leather at 350 gold each. Psy Latent Mortar and Pestle (54): 2691.186 location + 467.637 Latent Rune = 3158.823 gold + 91.177 skill = 3250 gold. Psy Watchful Mortar and Pestle (56): 2691.186 location + 1659.642 Watchful Rune = 4250.828 gold + 49.172 skill = 4400 gold. Latent Ayrann Whip (50): 2691.186 location + 467.637 Pyr Latent = 3158.823 gold + 91.177 skill = 3250 gold. Watchful Ayrann Whip (52): 2691.186 location + 1659.642 Pyr Watchful = 4250.828 gold + 49.172 skill = 4400 gold. Watchful Nocturial Whip (62): 2691.186 location + 1659.642 Eli Watchful + 700 Nocturial = 5050.828 gold + 49.172 skill = 5100 gold. - Latent Oceanite Mortar and Pestle (54): 3250 gold. - Watchful Oceanite Mortar and Pestle (56): 4400 gold. - Latent Ayrann Whip (50): 3250 gold. - Watchful Ayrann Whip (52): 4400 gold. - Watchful Nocturial Whip (62): 5100 gold. Edit: Added non-runic Nocturial Whip for reference. Last edited by Deva on Fri Mar 11, 2016 3:34 am UTC, edited 2 times in total. I would buy a 62 whip, though I need to increase hero skill by 1.5 to equip at present (the remaining Lanfar "bond with ..." tasks should allow me to complete this). Can anyone advise on materials for Oceanite quarry and Melandrin lumberjack camp to beat the land resistance, and appropriate hut / cottage / *other structure* to allow passive gathering please? I've not built anything other than an Inn that allows T3s to gather so far, and if a 6000 encumbrance structure can be avoided I would prefer to do so. I'm turning marapis into vaults before depositing to increase masonry, a neglected skill. This means the "required" number of blocks is now wrong. Not sure it's worth amending the spreadsheet, but wanted to make all aware. Iranganash Strait (Oceanite): 15 Snow (14 necessary). - Hut: Fir Framework (8) + Fir Plank Wall (8) + Cedar Thatch Roof (36) + Complex Nuertesilicio/Norstrian Mohair Bed. Maliken Sea (Melandrin): 37 Forest (36 necessary). - Hut: Nuertesilicio Framework (36) + Nuertesilicio Plank Wall (36) + Nuertesilicio Shingle Roof (Cedar Shingles, not Slate) + Complex Nuertesilico/Norstrian Mohair Bed. Works with Marapis Vault (36) and Marapis Wall (36) too. Scoped out dummies. Omitted Volcanite and Nocturial. Influences certain stats through material type. - Leather: Defenses (mainly Slashing). - Stone: Everything except Slashing Defense. - Fabric: Blunt Defense and Piercing Defense. Not fond of Azulio? Choose Soletto. After that, Salandrin. Not happy about Wingu? Pick Jutug. Downgrades slightly more with Huberian. Defined Fir/Soft Leather/Marl/Linen as baseline. Had 4/5/3 offenses and 5/6/4 defenses. Substituted one material out. Returned the values below. Left out weaker materials. It's interesting data though I can't really see the use for those dummies. Combat training doesn't appear to be based on effective skill at all. I suppose the only benefit would be if your overall offense is significantly lower than your offense skill and thus you have a hard time hitting a higher difficulty target. Even that said though, these are likely going to be in the 0.1 multiplier spot which will only add a very small amount to your offense. Realizes. Spent a while building the White Arena, though. Deserves a decent dummy. Could not discern what performed best at a glance (particularly with stone). I have a lot of Wyvern leather and palpable so no issue using those. I'd prefer NOT to use azulio or wingu. I'm imagining Salandrin + jutug/huberian. That seem reasonable? Sure. Will provide Jutug and Salandrin. Unrelated: Set companions before hacking down Giant Pines. Tallied it. Gained 10484 Fir Logs (for Firewood), 34493 Cedar Logs, 20526 Pine Logs, 51280 Maple Logs, 28638 Oak Logs, and 133192 Firewood. Finally surpassed Orchis in most items (around 25000). Edit: Forgot about Marapis Sand. Estimates around 59000. I have the domane ingots and will drop them off with the vaults sometime tomorrow, but have no personal source of eliandel or olkznar. I will have an eli mine in a few days as I finished the wing and recruited a hipporiel as my third t3 a few hours ago, but it's going to be a while before I have any meaningful supply of ore to smelt. 67 Academy: Clearmoon Dome + Marapis Vault and Walls + Palpable Towers, Fortifications, Foundations, and Dome. Handles everything. 64 Academy: Marapidos Dome + Lithosnow Dome + Marapis everything else. (Edit: Extra) 63 Academy: Clearmoon Dome + Fir Framework and Walls + Palpable everything else. - One Marapis part each of Dome, Foundation, Tower, and Fortification. Try Fir Framework and Wall. Are they insufficient? Use Slate or Cedar. Is that still too weak? Advises Acacia, Marble, or additional Marapis. Construct all remaining parts after deciding. Disclaimer: Never built an upper-tier Academy. Gathered Palpable for it, though. Experienced burnout lately. Accomplished everything desired and beyond. Wastes time on most characters. (Current tasks: Clandestine Guild Agreements, meat, Healing Vials, cutting Palpable, and Commerce/Foggy Pearls. Shifts Team Woodcutting to Kryanite Clusters soon.) Exceeds skill requirements by miles. Released Tarasquan over a year ago. Offered nothing compelling since. Last edited by Deva on Mon Apr 11, 2016 3:01 am UTC, edited 1 time in total. Yeah I'm mostly on auto-pilot here with having a char on regen, some on krya, some on runic identifying and one on noble identifying (for the elusive 5.0 emperator talisman). I mostly play on the weekend mornings go through and kill some bosses and train my combat skills a bit. There really does need to be some new content added. I know some guilds are making crazy things just to get them done, but I don't seem to subscribe to that notion of making things. I think the only legit thing left to make will be the combat place in the Den. Maybe I'll look into what we need to make for that (probably a megalithic build place in the giant plains to reduce transport time of all the giant parts). I remember it being pretty crazy in terms of what you need to move due to the super heavy walls though. Thank you Deva. I was thinking about Rowan, then thought that if I was going to build an academy, I might as well built one to cover all possibilities. Lack of content won't be a problem for me for some time, I think I'm about 18 months behind most of you. I agree it is needed though, any game that lacks new challenges will eventually wither and die. Hopefully the content will last a bit. I've been logging on every few days to setup random long term tasks (digging for that elusive 5.0 emperator for example) but otherwise haven't been doing much. I should probably finish training my boars' attack at the White Arena in Norstria but haven't really gotten around to it. Doubts much personal longevity. Pondered what would rekindle interest earlier. Concluded lots of quests and maybe clothing recipes. Might still be insufficient. Enjoyed individual and group progression. Ventured into others' specializations over time. Wanted greater self-sufficiency. Succeeded too much, however. Completed the game accidentally. Highest trade skills across all characters: 87 Fashioning, 73 Searching, 59 Fauna, 81 Flora, 74 Stone, 85 Metal, and 70 Science. I have been working on the Nostria family questlines and just have Caleron left to finish now, though the 60 snow check at the end will need some work - 60 forest in one of the other family quests was something of a struggle. Each one rewards a "Tracing : Rune ...." of some kind. I haven't started collecting runic artifact fragments, are these connected to the tracings in some way? And related to that come some other questions - there is a "porch" that can be built, and a mysterious device called a yggdracin, both of which are related to archeology in some way, but how? They might be slightly noob-ish questions, but while I've found discussions about calculating stats and materials for them, I've not been able to establish what they actually do and how all these things fit together. All of this has slowed me down on mining eliandel as I've needed the authority points for companions to make the skill checks in the quests, but I will get back to it. Penfold wrote: I have been working on the Nostria family questlines and just have Caleron left to finish now, though the 60 snow check at the end will need some work - 60 forest in one of the other family quests was something of a struggle. There are two types of Runic fragments. The ones you dig up and identify and the ones that are a consumable for activating runes. Identifying the dug up ones produces dead runes and the consumable fragments. Identifying the dug up ones can be done at any archeology machine (we have on in our primary shipyard in Hawkeria). To activate dead runes though you either need a Norstria temple (we don't have one with the appropriate machine because its a huge waste) or a porch. Porch blueprint is obtained from the Soriason reputation vendor. It requires 40 rep to buy. Yggdracine is needed for the porch (and Norstrian temples). I think the Yggdracine recipe came from one of the guild festivals. I suspect we probably still have a couple lying around the guild hall. The rune tracings you mention are the recipes for activating various dead runes. A number of those also came with a guild festival. I don't recall if there's a set of those left in the hall too. That makes sense, thank you. There are some yggdracin recipes and a set of rune tracings at the hall, I won't take any of them without asking first - am some way from 40 soriason for the porch recipe at the moment anyway. I'm going on holiday on Sunday, if I drop from the main guild later tonight, could I get an invite to the mining guild for until I get back please? Sorry I was out Friday to Sunday this weekend and didn't see this message until just now. If you did drop guild send me a message in game and I will re-send an invite to whichever guild you need once you're back. Deva wrote: Wanted greater self-sufficiency. Succeeded too much, however. Completed the game accidentally. Requirements for entry: Wandering Polymath, Yraen, 12 Kryanbor Nuggets, 3 Gold Ingots, and 3 Eliandel Ingots. Go to Behemoth Gorge. Accept "At the deepest of the Den". Bring a Wandering Polymath (Den Inn companion). Turn in the quest. Grab "A Cable to Reach the Stars". Needs Yraen in your party. Speak to them at Behemoth Gorge for "Assalans' Winch". Head to Hawkoria > Visitors' District > The Heroes' Shelter. Return to Behemoth Gorge. Finish "A Cable to Reach the Stars". Pick up "The third wish from the engineer". Skill check: 12 Kryanbor Nuggets + 3 Gold Ingots + 3 Eliandel Ingots + 38 Cave + [50 Leadership + 75 gold OR 50 Foundrywork]. Note: 10 seconds for Leadership. 1 hour, 9 minutes for Foundrywork. Skill check: 38 Cave + [50 Engineering OR 50 Leadership + Wandering Polymath + 75 gold]. Skill check: 38 Cave + [35 Engineering OR 50 Leadership + Wandering Polymath + 125 gold]. Note: 10 seconds for Leadership. 3 hours, 28 minutes for Engineering. 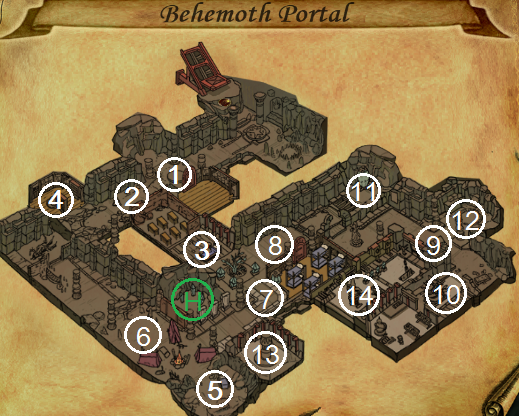 Reveals Behemoth Portal. Take “The forgotten”. Enter Behemoth Portal. Horned Sponge. 61/0/0 offenses. 57/55/43 defenses. Demonic Assassin. 0/61/42 offenses. 45/58/48 defenses. Behemotian Beetle. 36/39/0 offenses. 48/42/39 defenses. Chaotic Golem. 61/0/0 offenses. 63/62/62 defenses. Souxessor. 0/67/51 offenses. 51/59/58 defenses. Splits into multiple sections from here. Sends you outside the dungeon regularly. Advises attempting other quests instead of leaving. Requirements: 2-carat Small Sapphire, two Georgic Toenails, two Alcohologron, ten Gargkul Ash, four Necrofluid, and one Alchemideon Plasma. Note: Check the related skill for the herbs and meat/framework checks. Note: Seems optional, although handy. Cannot say with certainty. (1 on map) B4: Quest: “There is something lizardly”. Skill check: Endurance Ampoule + Healing Ampoule + Mobility Ampoule OR 45 Cave + [35 Taming OR 35 Extracting]. Turn it in. Take “Follow Beutelgheu”. (2 on Map) B5: Quest: “The rat in the wall”. Rewards Hexagonal Prism. Accept “Hunt the Intruder” afterward. Use the new Unlock the Wall task. Combat option: Strange Rat. 0/62/53 offenses. 70/71/61 defenses. Intelligent. Vigor (+30% damage dealt). Hop back to 2. Turn in “Hunt the Intruder”. Continue one space to the bottom left. Climb westward. Grab “The egghead reptile”. Pick up the pages. Exit the dungeon. Travel to Ducal Palace (Den). Take “The secret life of holes”. Sends you to Wolos Community (Den). Snag “A father and an archeologist”. Journey to Guard Station (Den). Complete the new quest. Replace it with “The seneschal’s archives”. Skill check (Black River): 4 Odiemel Ingots OR 40 Cave + [35 Spying OR 20 Commerce + 30 gold]. Trek back to Guard Station, then Ducal Palace. Finish the quests. Accept “At His Lordships’s secret service”. Hit up Henfeig again. Take “On Zobrak’s trail”. Skill check: 35 Spying OR 50 Exploration OR 45 Hunting. Exchange quests for “Explore the smugglers’ tunnel”. Requires ten Explored Tunnel. Explore the tunnel head down: 3-5, 50%. Five minute task. Three hour cooldown. - Nocturus Vulfuris x3: 0/48/45 offenses. 46/46/41 defenses. - Albino Troglodyte: 50/44/42 offenses. 48/43/53 defenses. Vigor (+40% damage dealt). Explore carefully the tunnel: 1-3, 75%. Fifteen minute task. Three hour cooldown. Combat: Besticus x3. 30/32/0 offenses. 39/37/33 defenses. Slowly explore the tunnel: 1-2. Forty-five minute task. Three hour cooldown. Turn it in. Grab “The liberation of Zobrak”. Skill check: Combat OR 50 Leadership OR 50 Exploration. Combat option: Four Korzkan’s Spies. 0/60/0 offenses. 55/55/65 defenses. Intelligent. Protection (Reduces damage by 30%). Loot from combat: Two Glanblan, four Twistyfoot, five Mobility Vials (+1.0 all), one Small Uncut Moonstone, one Frizifret, one Pisengele, and three Mobility Vials (Antracian Truffle/Star of Jotun/Tonnulur). Complete both quests. Get “A report for the Archduke”. Stroll back to Ducal Palace. Hand it in. Finish “Unusual Instructions” for Decrypted Message. Finally returns to Behemoth Portal. Wander back to 4 on the map. Complete “The Egghead Reptile” and “Follow Beutelgheu”. Save the Kryandel Jewelry Clasp. Zip to E4 (8 on the map). Accept “Troglodyte memory”. Leave Behemoth Gorge. Head to the Den Academy. - 45 Herbalism + 12 Mandrake + 12 Viperin + 12 Lamden + 1 Solone Sap. Trek back to 8. Rewards you with a Kryanod Key. Use it. Skill check: 60 Cave + 45 Exploration. Gives you a Cryptograms Lexicon and various loot. Leave the room. Grab “The explorers’ grave” from the troglodyte. Slide to E2 (11 on the map). Combat option: one Treforus of the Deeps. 0/83/80 offenses. 70/78/60 defenses. Intelligent. Protection (4) (Reduces damage by 50%). Vigor (+50% damage dealt). Loot from combat: Three Goldendart Honey, nine Foggy Pearls, eight Cavernotruc, one Small Volcano Heart, and two 3-carat Small Volcano Hearts. Skill check: 55 Cave + 40 Exploration. Grab “The murder weapon” next. Sends you to G1 (12 on the map). Hightail it back to 11. Turn it in, as well as the other quest. Speak with the troglodyte at 8. Finish that quest. Leave the dungeon. Turn in "The forgotten" at Behemoth Gorge. Head to G7 (5 on the map). Loot from combat: One Galandor Nugget, one Kryanbor Nugget, one Small Uncut Moonstone, four Eliandel Nuggets, and the Kryanroc Torch. Get “To end with death” from it afterwards. Exit Behemoth Gorge. Run to Maliken Harbor > Thousand Hands District. Take “Necromatic Ritual”. Requires two Georgic Toenails, two Alcohologron, ten Gargkul Ash, four Necrofluid, and one Alchemideon Plasma. Hand them over. Trudge back to 5 with ten Foggy Pearls. Turn in the quest for ten Kryanbor Nuggets and two Kryanroc Ingots. Allows you to resummon the boss. Scoot back to E7 (6 on the map). Activate the torch holder. Accesses H on the map. Finds Bemecalmos (68 Botany + 52 Cave. 1-3. 67 Calming Wild Herb) and Bemekinetos (69 Botany + 52 Cave. 1-3. 66 Energizing Wild Herb). Replaces Toenimus and Redauroch, respectively. Note: May be necessary to complete the easy Kryandel Jewelry Clasp section. Head up to F5 (7 on the map). Take “Fragmented Fresco”. Skill check: 53 Cave + [48 Taming OR 40 Blunt Offense + 30% leg damage OR 40 Engineering]. Kill random Behemotian Beetles for the five pieces. Return to 7 when done. Gives you a Completed Drawing. Grants you access to G6 (13 on the map). Skill check: 55 Cave + 30 Exploration. Gives you the Statue Password and various loot. Move to H3 next (10 on the map). Snag “Without own will”. Complete it. Take “A few more underground meters”. Skill check (at 10): 59 Cave + 32 Jewelry + Kryandel Jewelry Clasp + 2-carat Small Sapphire. Skill check (at 14): 55 Urban + 50 Engineering + Kryandel Jewelry Clasp + 2-carat Small Sapphire. Note: Receives Sapphire Dust from 10’s jewelry check. Trade it in for thirty Foggy Pearls at 14. Must complete the quest at 9 to access 14, also. Reward: An quick exit out from 10. Journey to G2 (9 on the map). Get “Open the wall”. Return to A6 (4 on the map). Skill check: 47 Cave + [55 Exploration OR 38 Archeology OR 40 Engineering]. Return to 9. Yields Secret Order. Activate the skeletal hands. Shared Home: 200 Blue Crowns per. Predicted the implementation. Guessed 30-50 Blue Crowns per share. Feels extremely expensive. Costs 5000-6000 gold at 25-30 gold per Blue Crown. Pass. White Arena patterns: 33.1 effort, 50 gold, and a skill check for 10% progress. 13 hour, 52 minute cooldown. - Sceptorunic Mace. 70 Stonecutting. - Short Runabow. 70 Woodworking. Stadium patterns: 33.1 effort, 10 gold, and a skill check for 10% progress. 13 hour, 52 minute cooldown. - Beat Poison, Scratching Poison, and Piercing Poison. 50 Hunting. - Poison Flayer, Poison Slugger, and Poison Dart. 50 Herbalism. - Minor Poison. 30 Botany (and only 8 gold). Changed Spying tasks. Offers more favors for better quality gems. Example: Military Favors at Maliken Harbor. 1 carat: 1-4 Military Favors. 12 Spying. 2 carat: 1-5 Military Favors. 15 Spying. 3 carat: 1-6 Military Favors. 18 Spying. 4 carat: 2-7 Military Favors. 21 Spying. Last edited by Deva on Wed May 04, 2016 3:03 am UTC, edited 19 times in total. 70 woodworking without location bonus? That's rough. I think I have 73 Wood/Woodworking. I don't have the Norstrian companion for woodworking either which is probably necessary. It is interesting they put the recipes on the White Arena. I wonder which ones are on the Den fighting building? Still probably just worth joining another guild to learn the recipes though if there are some. Stupid Den fighting area. I do suspect we'll need another Temple for that runic bow (*sigh*). Note the 200 BC for the shared home is to share ALL concessions with all characters on your account. They said they were going to do it per concession (at lower price) but it ended up being obnoxious to implement. Chen wrote: 70 woodworking without location bonus? That's rough. I think I have 73 Wood/Woodworking. I don't have the Norstrian companion for woodworking either which is probably necessary. It is interesting they put the recipes on the White Arena. I wonder which ones are on the Den fighting building? Still probably just worth joining another guild to learn the recipes though if there are some. Stupid Den fighting area. Chen wrote: I do suspect we'll need another Temple for that runic bow (*sigh*). Does anyone want to build that? Chen wrote: Note the 200 BC for the shared home is to share ALL concessions with all characters on your account. They said they were going to do it per concession (at lower price) but it ended up being obnoxious to implement. Blue Crown Shop wrote: The home key allows you to share one of your homes with all your account heroes. Sounded like one key to share one concession with one character previously. Increased it to one concession with all characters. I'm actually at 74/74 woodworking so I could probably get that up to 77 if I needed to to avoid using the runic potions. Course I have no Emerust so thats the next task. Yeah just noticed it is a single home for the key but for everyone on the account. May be overpriced at that if you don't consolidate everything. Good news: Learns recipes at a Den Telluric Sanctuary too. Bladerepulsor Membrane/Dartrepulsor Membrane/Macerepulsor Membrane: 65 Alchemy. 25 gold per task, except for three membrane package (30 gold). Offers the other guild combat building recipes, such as Short Runabow. Demands identical skill and time. Also of note in the new dungeon, I've fought about 4 groups of trogs (total of around 7 trogs) and have gotten 2 galandor ore and 1 nugget as drops. Unless I'm very lucky (which is possible, small sample size) this seems like an easy way to get galandor. Chen wrote: Yeah just noticed it is a single home for the key but for everyone on the account. May be overpriced at that if you don't consolidate everything. Loudthunder Forest and Whispering Forest: Secret Vault. Cannot build those on all characters. Den Home 1: Telluric Sanctuary, good Bestarium, and Den Inn. Den Home 2: Telluric Sanctuary, Field, Botany Trail, and Lumberjack Camp. Den Home 3: Telluric Sanctuary, Gem Mine, and Palpable Mine. Loses lots of Marapis from demolishing. Foresees little benefit from full access also, minus the Den Inn. Promotes buying materials over Blue Crowns, however. Approves of that. Re: New dungeon. Updated the spoiler with more. Appears substantial. Expected Ice Laboratory's size and five quests. Delivered the largest dungeon yet and a long quest chain. Seems quite nice. Learned nothing from previous quest design, though. Hates the Bad Neighbors-style quest. Favors Sociability heavily again. Discovered no good loot so far. Defeated 5-7 Horned Sponges, 5-7 troglodytes, two spiders, and a beetle. (Loves spikes, apparently.) Consisted of odds and ends. After the initial loot of 2 gala ore and 1 nugget I also stopped getting decent drops. Note though that the latter part of the dungeon doesn't have many trogs in it which seem to drop the good loot. The bugs drop garbage most of the time. I had an encounter with a rare spawn who was very strong (70-80s in all stats, intelligence BUT defense debuff). Also dropped crap. The boss (after you finish the necromancer's quest) dropped 2 krya nuggets 1 galandor nugget when I killed it. It was also quite easy to tank in Kdel/Dom armor (made before Kmane was possible, though really its only a slight change in pierce defense). The boss can hit hard (~40 against that armor) and it has 3 adds, all of whom were hitting for around 10. Depths drops have apparently been significantly buffed. Someone mentioned getting 3 wyvern blood off two wyverns and that the gold from the zombies was basically doubled (~20-30g per group now). In terms of Krya armor, Kdel/Kmane will probably be good for most things. The Kdel/Dom I'm using works good in both the swamp and this new dungeon (though the swamp is still very dangerous). With the new membranes it'll probably be a lot easier to push damage away from the bad Slash defense of that armor so its probably what I'd recommend. Kdel/Knod is good armor as well (good for the Ancestor boss), but I imagine won't be as good in the new dungeon due to the pierce attack mobs. I think the boss was blunt offense though so it probably works good for that. Also it does look pretty nice. I started the hunting poison task in my Telluric sanctuary and the lower difficulty alchemy task. The 14 hour cooldown there is annoying. They do seem to be 10% each too. Spending time gathering pearls so I can get a Emerust and eventually get the new bow recipes and stuff. I should grab my Autocrat too and get the forging ones though I didn't bother last night (it was late). Haven't found any new sources of volc lumps yet except Tarsinith. They trolled us good if that's the only source of lumps after giving us the recipe. Behemotian Beetle: Kryanbor Nugget. Estimated drop chance: 3-5%. Treforus of the Deeps (quest boss): Two 3-carat Small Volcano Hearts. Worthless, but interesting. Also three Goldendart Honey, eight Cavernotruc, and a 1-carat Volcano Heart. New herbs: Cannot pick them yet. (Edit: Calculated it. Needs a 3.2 Botany potion...on a different character. Hates the Wandering Polymath requirement.) Replaces Toenimus in Calming (52 -> 67) and Redauroch in Energizing (58 -> 66). Helps Calming runic potions only slightly, due to 65 Calming on Volcazu. Bolsters Energizing potions nicely, however. Lower Depths loot: Good. Hated that grind. Volcanite Lumps: Discovered nothing also. Might drop from Spirit of the Depths. Resembles Tarsinith's source (a red spirit). Lacked anything worthwhile so far. Edit3: Looked through the profession chest. New items: Hipporiel's Tear (Binder), Bemekintos (Herb), Bemecalmos (Herb), Bemefocalo (Herb, not seen at the herb spot), and Olkgu Fabric. Cannot recall whether Wingu Bundle/Fiber existed previously or not. Edit4: Grinded a bit. Updated drops. Paid attention to sources, not kill counts. No Olkgu Fabric or herbs yet. Managed decently with Chaotic Golems. Cannot handle 30-55 damage Bully smacks well. Acquired meta herbs from Bullies. Might drop new herbs too. I haven't grinded the loot in there but its pretty inconsistent from what I saw just doing the quests. Never got anything good off the bugs or bullies, though I had gotten some meta ingots off the Golems (no Wingu cables). Wingu bundles have always been in the profession chest. I used some BC and fast tracked the runic sword. I had sent you a message regarding runes to test. It's not super, best I saw with Kmane was 39 pierce/51 slash and its uncraftable at 84 forging. Heard that the mirror targe isn't great and the other shield is a base 15/30/15. However someone did mention the mirror targe stats aren't that high implying it may not need a runic temple (or it's done in the foundry temple or something). Working on pearls for an emerust. I'm not even sure what the second woodworking recipe (targepic) is actually for. Someone else had also mentioned the mace is only around 50 blunt which seems quite bad. For the recipes I'm currently doing the second forging one (shield), 2 alchemy ones (membranes) and the hunting one for the poisons. Even with a Volrizier still I need a small potion for the alchemy one which is annoying. Oh also someone had mentioned that 83 sewing is possible with one of the new potions. Not sure what you actually get from that though. Sent Pyr, Lith, and Lect Watchful Runes. May or may not help. Sympathizes on potion use. Drinks 6.6 Stonecutting (normal) vials every time. Crafted two quick runic Mortar and Pestles to even manage that. Cannot decide whether or not to share the Den Inn concession. Leans towards no. Costs less to build it on every character. (Only cares about two more, presently.) Sees little reason to share other infrastructure there. Feels irritating either way. Wants to use the feature. Seems too cost-ineffective except for sharing an Academy…in the future. Will not balm anyone else’s Boarserker. Does not need an amazing Fashion House, Bestarium, Greenhouse, or Laboratory on multiple characters. Edit: Oh, right. Forgot about demolishing. Saves more by simply building. 83 Sewing: Looked previously. Remembers nothing useful. Might reach Stardust Bracelets easier, though. Recorded grinding this time. Learned nothing particularly new. Might grind Mutated Troglodytes or Chaotic Golems next time. G2: 1-2 enemies. Enemies: Souxessor, Bully, Behemotian Beetle, and Chaotic Golem. H2: 1-3 enemies. Enemies: Souxessor, Bully, Behemotian Beetle, and Spirit of the Deeps. - Ignored gold and Foggy Pearls. Mildly interesting: Faced all four Spirit of the Deeps encounters almost consecutively. Im of the same mind for the shared concession. I could share my main home which has my lab and academy in it. I could then put a Fashion House and Greenhouse in it instead of having them where they are. But honestly I don't even have boars for my alts. The den concession could be good too with the beastarium and telluric sanctuary in but again it seems wasteful. I could consider moving my Academy to the Den and then sharing the concession (im pretty sure the one for a boar has sufficient terrain for it) but there's not much else I'd want for that. I kinda got annoyed with bothering to level up alts in terms of combat and stuff so I just left them doing various tasks while I got every skill done on my main instead. In that regard I may just hold on to the key until I need it for something in particular and use it then. For the dungeon it really does seem like the trogs/golems are the valuable ones. The bugs seem kinda crappy. And of course the boss seems worthwhile to kill and is quite easy in Kdel/Dom armor. I am interested in seeing what that thing they added to the Owl for making better armor is though. I'm still a long way from being able to kill it though. Need to get my piercing offense higher and the only real way to do that I think is to grind watchmaker which is costly as hell. Perhaps the new poisons will help if they are significantly strong (+5 or so). Recorded Mutated Troglodyte farming. Felt unrewarding. Short version: One Galandor Nugget. Dropped nothing somewhat often. Might have amazing, but rare drops. Compares them to (old) Albino Wyverns and Demonic Bones. Killed hundreds. Dropped one Demonic Bone. Hinted at it through constant upper-tier bones. Main Location: B4 to adjacent spaces. B4: 2-3 enemies (usually three). Enemies: Mutated Troglodytes and Behemotian Beetles. Skews towards Troglodytes. B5: Typically three Demonic Assassins. Mixed in Troglodytes sometimes. A4: 1-2 enemies. Included Horned Sponges, Behemotian Beetles, and Mutated Troglodytes. Drank twelve 31/6 Healing Vials. Ignored gold and Foggy Pearls. - Bully: 1 (0.68%). Appeared near the entrance, not the main location.